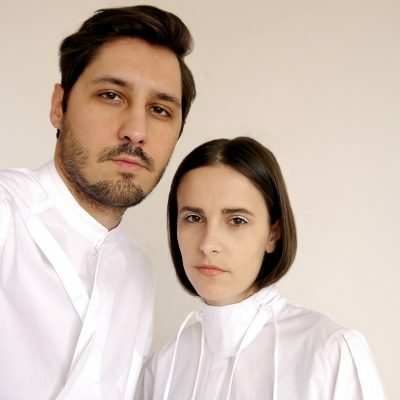 CONSTANTINE/RENAKOSSY is an independent designer label founded by the designer-duo: Constantin Băbeanu and Renáta Rákossy. Established in 2013, in Transylvania (Eastern Europe) CONSTANTINE/RENAKOSSY is designed and produced in Cluj-Napoca, the whole manufacturing process being controlled by us, as an in-house activity and with our collaborators. As a designer-duo brand with a focus on sustainable and ethical local production, CONSTANTINE/RENAKOSSY creations might be described as clothing that provides a remarkable appearance through strong visual impact. With a conceptual and contemporary approach, our creations are intended for a variety of clients, from streetwear to high fashion. Being able to control the whole process, starting from design, pattern-making, sampling and production allows us to develop high quality products, where a lot of thought is given to every detail and functional/technical aspects of a garment. CONSTANTINE/RENAKOSSY items are designed with a focus on functionality, with consolidated design principles. All our collections are based on a concept reflecting contemporary issues translated into visual metaphors –emblematized in the surface pattern designs and prints.